The Café 19:26 is not, and is not intended as a tavern or a restaurant, but a cozy and welcoming "bistro". Only two starters and two main dishes, always different every day, to be consumed without haste in the lunch break or, alternatively, but at all hours, special proposals for seasonal tasting. The Bistrot Cafè 19:26, with the warm welcome of its people, offers red wine of Montalcino and simple but accurate dishes served between books, small tables and glass windows mirrors reminiscent of the old Florence local capital with the charming atmosphere and joyful stolen in Montmartre. Let groped by the delicate flavors of Romeo cuisine: truffle of San Miniato and foie gras of the Camargue are mixed with the dishes "poor" Florentine giving you moments of mild pleasure. A tea, a coffee, a slice of sweet, even with live music, will make special every moment of pause. 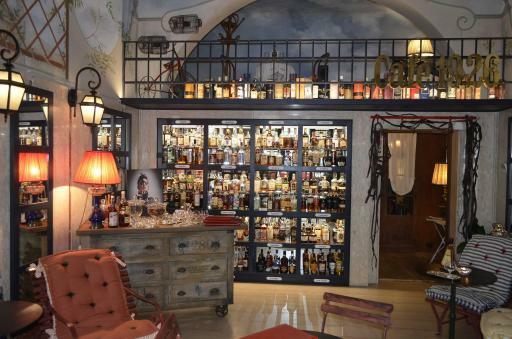 We will guide you in the rum room, unique in Florence with a selection of over 180 bottles from all of the Caribbean Islands, in a mixer of dark chocolate, precious woods and soft lighting. And Matthew, sitting in the carriage, will satisfy the curiosity of those who does not know the magic of Cuban cigars.